These dolls inspire girls to look beyond their image, and be active participants in their lives. The Go! Go! Sports Girl dolls were created by Jodi Norgaard in Glen Ellyn, IL, when she couldn’t find age appropriate dolls for her young daughter. She created the dolls to provide a fun and educational way to promote self-appreciation and the benefits of daily exercise, healthy eating and high self-esteem for girls ages 3-12. The dolls represent a variety of sports, including soccer, running, swimming, dancing, gymnastics, cheerleading, golf, volleyball and tennis. Some of them come with story books telling how each girl learns her new sport and how the sport impacts her life. 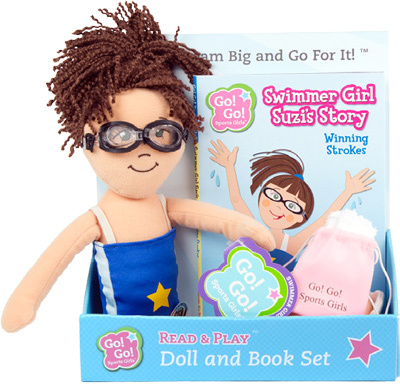 The book and doll sets are designed to promote active play and empower girls.